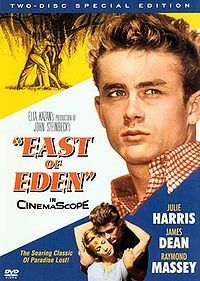 East of Eden is a 1955 film, directed by Elia Kazan, and loosely based on part of the 1952 novel of the same name by US author John Steinbeck. It stars Julie Harris, James Dean (in his first major screen role), and Raymond Massey; it also features Burl Ives, Richard Davalos and Jo Van Fleet, and was adapted by Paul Osborn and John Steinbeck. Although set in early twentieth century Monterey, California, much of the film was actually shot on location in Mendocino, California. Some scenes were filmed in the Salinas Valley.